If Ulaanbaatar helps to point towards Mongolia’s future it is the ubiquitous yurt which is synonymous with its past. As we skirt northwards towards the Altai Mountains passing those white clothed structures laced with horse hair as the smoke from dried dung rises through the roof, they take on a standing more than just as an abode occupied by the majority of Mongolia’s population. The yurt signifies a way of life, history and culture which is far older than the country herself and was first recorded by Herodotus – that of the nomad. We were lucky enough to have crossed the threshold of several yurts into this world during our skirmish in Mongolia. The most memorable was in the town of Ulaangom, several days riding from the border with Russia. 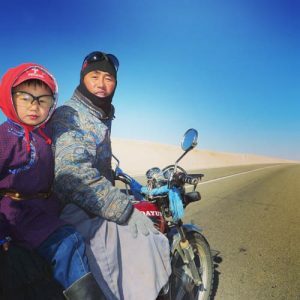 Seven kilometres outside of town, down a horrifically bumpy headache inducing track, we visited a Mongolian family to go horse riding – Mongolian style. It was a terrific experience and though the horses did not really listen to either of us, munching on some grass when they felt like it, luckily it didn’t involve getting bucked off. As we approached, a two cylinder motorbike sat outside the yurt next to the lower horse powered horse. Throughout Mongolia, many of the younger generation prefer herding using a motorbike; the symbol of the 21st century cowboy in the new Wild West. A solar panel glints next to half a dozen newly born goats tied against the cloth as a small satellite dish powers the newly purchased television. Such is the modern fusion of technology with the structures over 3000 year old history. 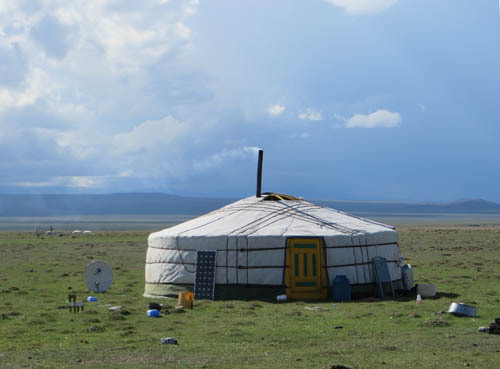 To prevent overgrazing and based on precedent one will rarely see more than two or three yurts within several kilometres of each other as the family unit constitutes the modern clan. The families herd, of no more than 100 cows, sheep and goats sat idly on the marshy plain picking on the grass as blue paint on the horns marked their ownership. It is rude to knock on the brightly coloured doors of yurts so in a shaming accent, reminiscent of some unidentified dialect, I call out ‘Nokhoi khor’ to the family which roughly translates as ‘Can I come in?’, but literally means ‘Hold your dog’. This is to avoid being eaten by a vicious and highly protective mongrel which stalks the property. Over the past weeks we had been chased by dozens of these less than puppy eyed security systems as we passed by their homes. Here, three generations lived in the two yurts within ten metres of each other. The parents lived in one, which we were invited into, and their children and grandchildren in the other. As I circled around the outside of the yurt I could see the beautiful simplicity in its construction. It can be assembled in two hours and the Mongolian nomads can deconstruct, transport and reassemble them within a day. Daily we would pass a truck or mini-van laden with a family’s belongings that were moving. The bones of the structure are an expanding wooden circular frame which consists of several lattice wall sections, a door frame and bent roof poles which plug the walls to the central wooden crown to act as a roof. Felt acts as the meat of the structure and a cotton cover as the skin, waterproofing the building. This is then wrapped together in a cake shaped package by three tightly bound ropes of horse hair. Such ease of assembly is necessary as families will move around more times in a year than most Western families do in a lifetime. This is roughly six to find fresh pastures for their herd. Every yurt in Mongolia has its gaudy door facing south, granting significance to the cardinal directions. As I duck through the 4 foot hobbit-high door frame placing my right foot first over the threshold as the ancient code demands I move around clockwise (women move around anticlockwise) not stepping between the two central pillars that represent the link between earth and sky. I am invited to sit on a small stool in the north west segment, next to the shrine or ‘Xiomore’ (the sacred area in the north), which is reserved for honoured guests. As tradition demands I keep my feet pointed away from the sacred hearth and do not turn my back to the shrine where a Buddhist image, suitcases, a photo of the male head’s father in his sharply cut military uniform and other treasured objects rest. 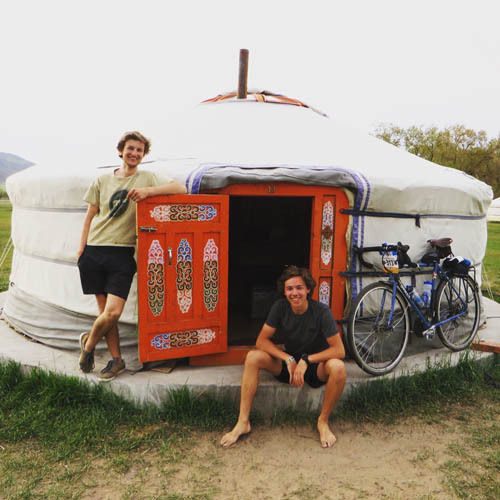 Since yurts have no walls it makes them very intimate and inclusive spaces, epitomising the importance of family which is central to nomadic life. The man reaches with his leathered hands into deep pockets to produce a small jaded bottle of snuff. Will accepts it first with his right hand touching his inner arm with his left hand as a sign of respect breathing it in deeply as it tickles its way down his nostrils. Hospitality is traditionally so important and it is deeply insulting to decline anything, at least without trying it, as I gratefully accept the snuff of which many nomads cannot afford. The inside of the yurt is pristine and is kept with the same pride as a Maharajah’s mausoleum. Everything has a place and purpose. The portable sink is stationed just left of the door. On the western side (male side) there are stacked saddles and leather milk bags. The east side (female side) contains cooking implements, water, buckets and the food preparation area where the wife silently prepared us tea with salted goat’s milk. A pair of reading glasses, wallet and tooth brushes were cozied in-between the orange painted wooden beams, which represent the colour of the sun, and felt above our heads. Underneath the cabinets lay the bare ground as there was no groundsheet (which is an indicator of the family’s wealth) as it followed the natural contours of the dried earth. In the centre of the yurt, or ‘ger’ in Mongolian, is the practically and symbolically significant hearth. Here the wife knelt down and began to heat up the milk tea as it bubbled up warming the space. As we sat there with the man, his Chinese cigarette perched neatly in between his tanned fingers, looking through his photographs, his son, a boy a similar age to us entered wearing a vintage Adidas shirt and plonked himself on his mother’s bed. I was surprised as this area was traditionally reserved for women exclusively. We glanced at each other smiling as we viewed the photographs together. As we finished flicking through them the man noticed Will looking at his 2:2 bolt action rifle, which was probably Soviet era from WWI. He grinned and grabbed it. It looked similar to the Lee Enfield’s we used during the days of CCF training at school. Pressing the worn wood to his shoulder he cocked the bolt and took aim through the chipped metal cross in the direction of our heads as the cigarette now in between his lips glowed an ominous red. With a click of the trigger a puff of smoke emerged from his cigarette as he handed us the gun before replacing it next to his wife’s metallic single bed. This surprised me too as traditionally a weapon should have been next to the male bed. Later in the afternoon, as we sprinkled special flour on our endless cups of tea for added flavour and he briefly flicked on the TV, I started to understand the erosion of their traditions as several belly dancers entered the room through the screen. 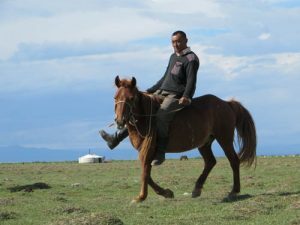 Whilst traditions and customs are still very important to the nomadic people, particularly those who have chosen not to leave this way of life for the static existence of Ulaanbaatar, the influence of the outside world has creased their edges. Previously commonplace customs like men keeping their hats on indoors, picking things up with palms facing upwards and filling up any glass that is empty are increasingly becoming forgotten in the face of the inexorable pool of modernity as their lives are synthesised with a newer world. 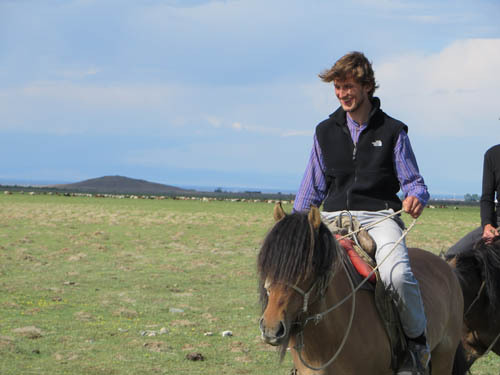 I am thrilled that western comforts have made the lives of many hundreds of thousands of nomads easier, particularly as I witness swathes of the country suffering from desertification, soil erosion and the evaporation of their water sources as Mongolia’s 60 million cattle compete for space in the face of climate change. I do hope, for the sake of their beautiful culture and country which I was privileged to share in however fleetingly, that both are not lost. 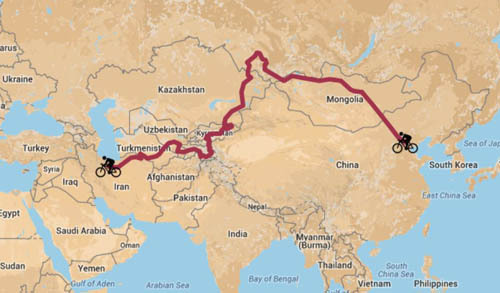 Read more about Charles Stevens’ epic journey on http://beijingtotehran.com/ Or make a donation to his chosen charities.